I came back early from a marvelous weekend at the PDN Expo in New York (where I picked up a few new secret weapons) to shoot a job for the Wall Street Journal. I woke up extra early to drive into DC to follow WSJ senior editor, automotive industry reporter and columnist Joseph White as he commuted to and from work without a car. After recently moving to the District from a lovely Detroit suburb where he drove to work every day, Joe is slowly readjusting to the new lifestyle of a much smaller loft-style home, no car of his own (he used to have a WRX Impreza- even I’m sad he had to sell it) and a commute that includes squeezing onto trains with the unwashed, sneezing, coughing, headphone-noise-leaking masses. 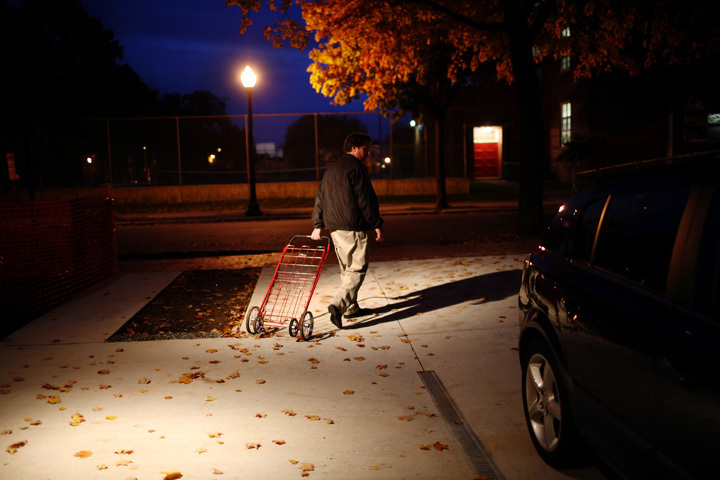 In the evenings, he can walk a few blocks to his neighborhood grocery store with a sporty little red cart and load up on fresh foods. The WSJ did a great job of putting my pictures in an online gallery to accompany the column. Posted on 10/29/2009 08/08/2013 by Melissa Golden. This entry was posted in Feature, On Assignment, Wall Street Journal and tagged car-free, commute, DC, Feature, joseph white, On Assignment, Reportage, WSJ. Bookmark the permalink.